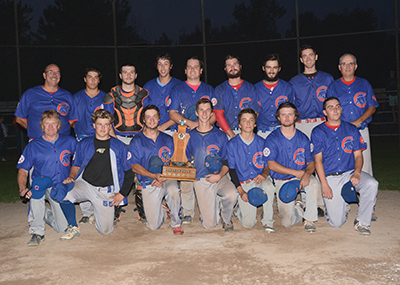 After a stellar season that saw them lose only two games, the Mansfield Junior Cubs claimed the 2018 North Dufferin Baseball League championship title with an 8-4 win over the Ivy Blues in game three of the final series. The final game got underway on Thursday, August 23, in Lisle. The Cubs were leading the series 2-0 after taking an 11-3 win in game one in Mansfield then following up with an 11-0 win in the second game of the best-of-five event. “It was fun, it was exciting, it was a good time,” said Cubs catcher Ryan McLean of playing in the final series. “We had to approach the series as if we were down by two. That way we don’t let up on the gas pedal. We want to keep accelerating and drive through so we can catch another win. This is the third year in a row the Cubs have gone to the championship final and the second consecutive season the have come out on top. This was the 37th time the NDBL had a junior championship. The juniors started playing in 1983, with a five year gap from 2000 to 2005 were there was no junior division.